We have gained recognition as the significant exporter, wholesaler, retailer, importer and supplier of an exclusive collection of Diamond Gemstones. These diamonds are finished by vendor’s experienced workforce using advance tools & raw diamond as per the latest market trends. Offered diamonds are praised by our customers for its eye-catching look and best finishing. 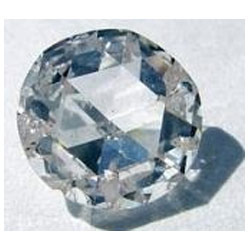 We offer these diamonds in various designs and shapes as per their requirements in stipulated time. The name diamond is derived from the ancient Greek αδμας (adámas), "proper", "unalterable", "unbreakable", "untamed", from - (a-), "un-" + δαμω (damá), "I overpower", "I tame"
The range of Cut Gemstones, highly commendable and diverse in nature, is exported, wholesaled, imported and retailed by us at Ratnalaya, ever science our establishment in the year 2003. The offered range is made up of the finest Natural Gemstones, Precious Gemstones and Semi Precious Gemstones, which are which are highly desired in the market. The range’s making involves the using of the finest machines, as per the set industry standards, at the vendor’s end. Owing to this, the product has its quality highly standardized. In addition, it is marked at the most reasonable rate possible. The ultra-modernistic warehousing facility at Ratnalaya, has been laced with all the required machinery, which facilitates the attainment of a number of our goals and objectives. To preserve the goods for a longer period of time, the facility has been designed to resist natural calamities. The facility, spreading over a huge area of land, is highly spacious in nature. In order to manage the firm’s operations in the best possible manner, the facility has been compartmentalized. In addition, our abidance of work ethics, have helped us in attainment of several highly reputed clients, comprising reputed names like Goldiam Jewelry, Sanghvi Jewelry and Gold Star Jewelry. Our huge client base includes markets in India, Asia, US, UK, Africa and importing from Sri Lanka.